With its sleek, stainless steel mixing bowl and lustrous, metallic chrome finish, there's no denying this KitchenAid stand mixer is a show stopper! 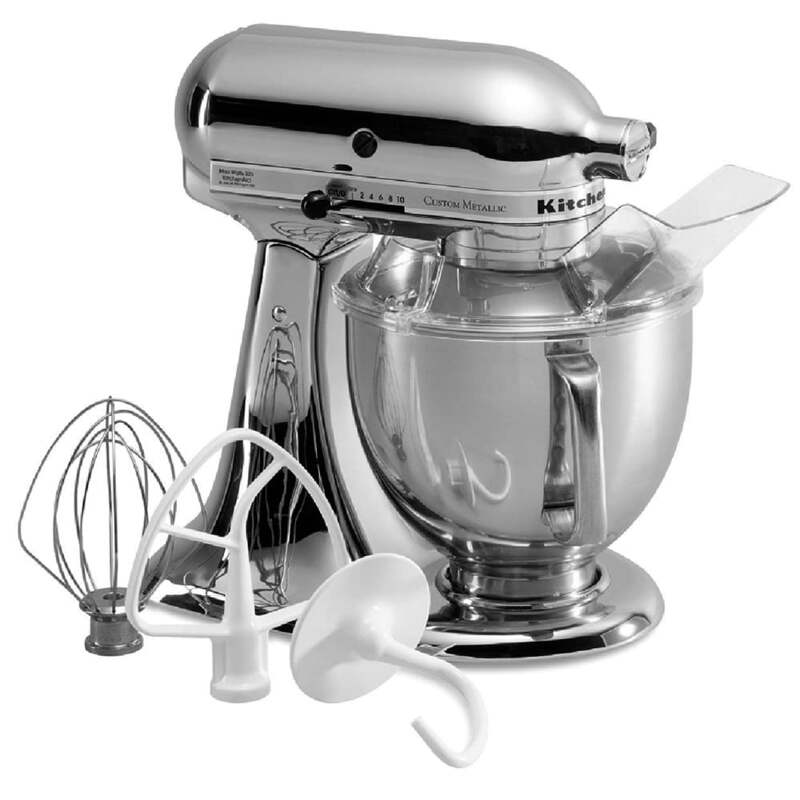 However, with its 10 speed options, three included mixing attachments, and accessory attachment capabilities, this mixer has more to offer than undeniable style. Use this tilt-head stand mixer's flat beater for whipping up heavy mixtures like frosting or mashed potatoes. Use the wire whip attachment to incorporate air into eggs and heavy creams. Or, use the sturdy dough hook attachment to mix and knead dough for pizzas, yeast bread, and more. Attach this stand mixer's convenient pouring shield to evenly incorporate ingredients like chocolate chips throughout the blending process with minimized mess. And, when you're finished mixing, the user-friendly design of this mixer makes clean-up hassle-free. Simply tilt back its motor head to easily remove the dishwasher-safe mixing bowl and attachments. Note: Optional attachments (sold separately) can be attached to this home mixer's attachment hub to make anything from pasta to fresh citrus juices to sorbet. Warranty on this home mixer is not valid when used in a commercial environment such as a bar or restaurant. 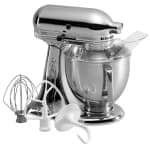 5 quart Custom Metallic® Series stand mixer, polished stainless steel bowl with comfortable handle, coated flat beater, coated dough hook and wire whip, 2-piece pouring shield, custom 5-step plating process, 325 watts, 120v/60/1ph, Chrome. Warranty not valid when used in commercial environment such as a bar or restaurant.